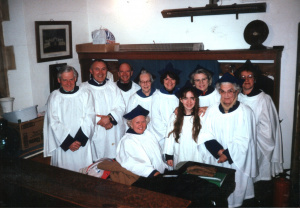 Jack Radbourne was the Verger when I arrived, and he based his conduct in serving as Verger, on John Lively, with perfect accomplishment – including the loud amens. Jack also had a strong bass singing voice. So did Ralph Dodd who sat opposite him. Ralph sang each bass note with perfect precision and timing. Jack wandered a bit in his bass notes, occasionally hitting the same note as Ralph – and sometimes not! Both men entirely obscured the trebles who sat behind them, boys one side and women and girls the other, and their strong bass voices almost drowned theirs! The congregation didn’t fare very well either! 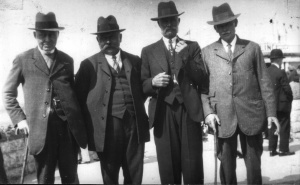 But the two mens’voices could be heard clearly outside in the street. 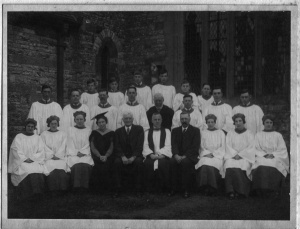 The choir, in 1938, had 7 men and 6 women. Choir Mistress was Doris Dodd. 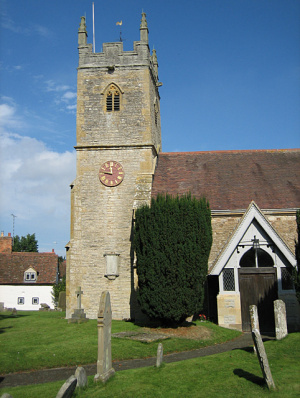 Each May, the Cross and Bearer, Choir, Doris Dodd, Rector and congregation all processed out of the Church and round the village for Rogation Sunday, stopping every-so-often for prayers to be said – for the school children – for those working in the fields – for those serving and buying in the Village Shop etc. Please note, in one of these photos, the double-decker bus that had brought a number of the congregation from Stratford. In 1968, the choir consisted of the two men already mentioned, 3 women, 4 teenage girls, 8 little girls, and 8 boys. 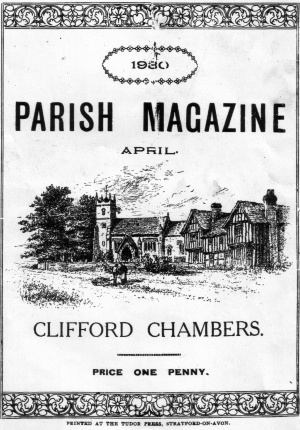 To provide robes for all the little ones in the Choir, a Pantomime was held for three days, with one matinee performance, in the Jubilee Hall, with all the younger choir members taking place. Denise Reynolds was a sweet little Cinderella, and Caroline Spragg her handsome Prince. Martyn Spragg was a page, but the two who bought the house down were the ugly sisters, played by Paul Leonard-Williams and Ian, his friend. Elaine Harris was the Queen Mother, and Stephen Leonard-Williams the King. Then we had various children and mice, one of whom was Christine Evans (now Beasley), and I believe Buttons was played by Neville Evans. The Pantomime was so popular, that people who came the first night, turned up the second night so they could have another amusing night! At the beginning of last Century, the choir and Sunday School children went to Red Hill House every Christmas Day at 6.00pm for tea in the Pippets dining room. The long dining table was decorated with flags of all nations. After tea, presents were given out from under the Christmas tree. Psalms were only sung at Harvest Festival. Miss Wilding played the American organ. Before that instrument arrived, there was an harmonium costing £3 bought with the proceeds of a carol singing expedition. And before that, the congregation had to rely on the various instruments played by the villagers sitting in the Musicians Gallery at the back of the Church. 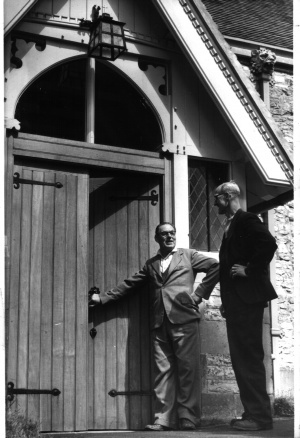 When our present organ arrived in 1931, the American organ was given to the Methodist Chapel in the village. The lady who took the register at one time at the Sunday School was Miss Padbury. She originally lived at Mill House, an elegant figure with feather boa and parasol. Len Salmon, born in 1910, could remember, as a little boy, walking up the drive of Red Hill House with the other Sunday School children, to have Sunday School with Miss Monica Pippet. 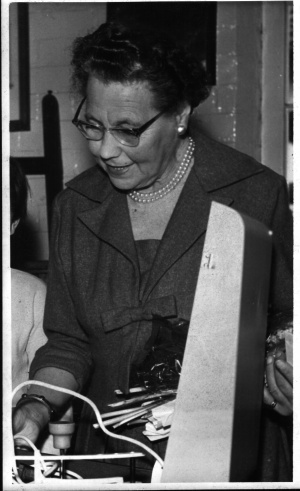 Miss Edwards taught the Sunday School in the 1950’s. After the War, we had a Choir outing to Weston-Super-Mare. It was my first view of the sea. My Mum gave me a sweet ration coupon to buy a candyfloss for me and my brother. Most of our outings after that were to Cheddar and Weston-Super-Mare. The coach was always full, and we always called for fish and chips on the way home. We always went three times on a Sunday to Church; choir attendance at morning and evening service, and Sunday School in the afternoon. This was taken by Canon Brooks and Miss Dodd. We always received a coloured stamp to stick into our attendance book. The Sunday School treat was a tea party at The Manor. This was at Christmas where Mrs. Rees-Mogg always had a present for us – a useful present! I still have the two sewing kits I was given, one in the form of a lady’s bonnet, and one in the form of a girl in a hooded cape, and they are still being used! In the summer we also had a picnic at The Rectory, with games. When I (Avril) arrived, Mrs. Leonard-Williams was taking the Sunday School with the help of some mothers and teenagers. 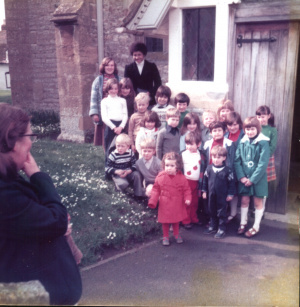 When the Hawkins arrived, due to such a small number of small children in the village, it was decided not to hold Sunday School for a while. Instead, we had Childrens Church, taken by Rev. David Leonard-Williams, assisted by his wife and sister-in-law, and Miss Baker, the headmistress of our village school. Quest Club started round about 1982 when the Hawkins left. This page was last modified on 15 February 2014, at 16:24.